Since the changes to Part L of the Building Regulations in October 2010 there is a new method of complying to the building regulations. Part L of the building regulations (Conservation of fuel and power) is the area of the Building Regulations that covers thermal efficiency and energy efficiency. Previous to these changes, in order to get windows and doors to comply you needed to achieve a good overall U-value or specify a sealed unit with a centre pane U-value of 1.2 or less. The lower the U-value the less heat is lost through your windows. Complying by simply specifying a sealed unit with a U-value of 1.2 has since been scrapped and replaced with the Window Energy Rating Scheme. The aim was for the WER to simplify, for consumers, the more complicated values for thermal efficiency, solar gain and air leakage into one basic A-G rating for overall energy efficiency. What Are Window Energy Ratings? 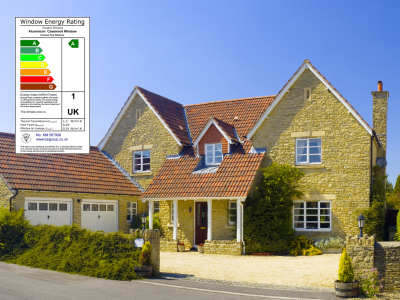 Window Energy Ratings provide an outline or overall value for how energy efficient a window is. They take into consideration the thermal efficiency, solar gain and the air leakage of the window. Windows are rated using an A to G scale to symbolise the total energy efficiency of the windows. Where an ‘A’ rated window is the highest rating in energy efficiency and a ‘G’ rated window has the lowest rating in energy efficiency. Window Energy Ratings are tested and approved by independent organisations, so you need to be sure that a manufacturer can verify the performance claims of their products. This rating is designed to be used specifically as a guide to help consumers choose between window systems based on the overall energy performance of the windows, and give them an idea of how likely they are to save money on their house hold bills, when installing these windows. 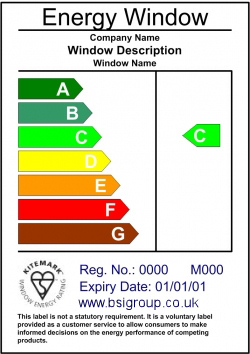 Please note the difference between WER (Window Energy Ratings) which are used to meet building regulation part L for energy efficiency of windows, rated from A-G... and BREEAM (BRE Environmental Assessment Methods) - a green guide or standard for best practice for rating the sustainable / environmental performance in building and manufacture, also rated A-G.